Very glad I hadn't packed my heavy winter coat, as I needed it with the wind and storm that came in last Wednesday. Hopefully that's the last of it for cold wind chills. Grateful for ways to spare my back as I haul furniture and boxes. I bought a four-wheel dolly since it's a distance from the door to my garage. I also found that using folding trays helps. That way I don't have to set the box down to lock my door, then set it down again to open the back of the minivan. It was all that extra picking up which was taking a toll. I can also 'stage' the dolly by the outside door so I don't have to take a trip for every single box, just get each from my apartment outside to the dolly, heap up a few, and then haul to the garage. So heaps of snow and ice meant the dolly didn't work as well as anticipated Saturday morning (it's not a tank!) but grateful that I was able to get my guest bedroom dresser and two medium bookcases out to the storage unit, along with smaller items. Lots of action with the move at work also. Last week after my coworkers left, the furniture got hauled away (except for the three of us in my team). This morning the old carpet was pulled up and replaced, with surprising speed. I'm curious to watch the building of our new cubes and work area this week. We might actually be moving as soon as this Friday! Not move-related, but it's been a treat seeing the sunrises as I head to work lately. Had three nice ones in a row last week, the most amazing of which was Wednesday morning before the big storm moved in. Today brought a pretty sunrise too; gotta enjoy them before the days get too long! It's April! That means I made it from November through March without any falls on the ice. So much better than the previous winter! That interminable render for the art project I'm working on finally finished after around 92 hours. Hopefully that will be the longest bit! The storage unit I rented to help with moving is 'free' (save insurance) in April, so I won't see a bill until May. For some reason the neighbors decided to have a loud raucous party on a Monday evening. That made me even more grateful for the white noise contraption I bought a couple months back. Had to turn the volume up a few notches, but that was much better than the hours of sleep I'd have likely missed otherwise. Deliciousness is Dawn's homemade apple pie that she brought to work on Tuesday. Got out for a walk with Cindy on my day off Friday. Took her to an area by the Minnesota River she hadn't been to before. We saw some early migrating birds, watched a muskrat gnawing on something that was either crunchy or frozen, but the highlight of our walk was definitely the beaver out of the water enjoying the spring sunlight like we were! I'd brought my binoculars, but alas I did not bring my camera. Also on Friday, paid for a storage unit and started hauling stuff over to make packing and preparing to move easier for me. To my delight, the unit is just two doors left from the one I used in the summer of 2016, so no confusion over where to drive! A blessing Sunday. I spent a day with God, and it was finally warm enough that I could take the Towner's minivan to a parking lot for a loud worship session since I can't do that kind of stuff at my apartment. What a blessing! Great to enjoy dinner with the Towners Tuesday night and a good resolution to the challenge of getting their extra minivan over to the dealership for maintenance and repair work. My employer having a food drive in March was perfect timing for me to unload some of the winter surplus I'd stockpiled, like pasta and various canned goods. Less to pack, yay! Had the third showing of my apartment on Wednesday, and it just might be the last one, since the listing vanished off the website Thursday. I'm really hoping that rental application goes through so I can start making a mess with packing! Progress on the moving front at my job as well (since everything comes up at the same time, ha ha). I've been slowly bringing home stuff from work since my new cube will be smaller than my old one. On Wednesday my boss shared the floor plan for how the area is being redone and all the other people coming to be new neighbors. It will be quite a change sitting near my boss's boss...and her boss too! So my wonderful editor who was supposed to finish with the fourth Geren book on Monday wasn't really late...she was just using an outdated email address! That meant, also on Wednesday, I got The Subverted War back and can start the last stage of tweaking and polishing...whenever it is I actually have the time for that! Requested two days off work so I can have a four-day weekend starting Friday. Here's hoping I can get a lot done with moving preparation but make time for some enjoyable stuff too! Hurrah for a payday Friday! The Towners had me over for dinner Tuesday evening, and it was a wonderful time. Delicious meal, got to finally show them my trip photos, and fun to do some catching up. The high point of the workweek was Thursday, as that was Pi Day. I cooked two spinach pies this time, and was very grateful to have ice cleats to safely carry it all over the wet ice to the bus stop in the rain. This year, aside from spinach pie, I got to savor apple pie, triple berry pie, Key Lime pie, and peanut butter pie. And then Friday brought leftovers...more spinach pie and some strawberry rhubarb pie. Yum yum yum! Glad to have only one apartment showing during the week, also on Thursday. After days of rain, a delight to see some blue skies Friday. An amazing sunrise the morning of my brother's birthday--all pinks and oranges like spring flowers. Treating myself out to Freshii for lunch Friday, and trying a different menu option that's now my new favorite. Had the first showing at my apartment Friday, and grateful to have none over the weekend, as that gave me a chance to pull out some boxes and make a little mess! So the big storm ended up falling as rain quite a while before it turned to snow. But that just made the snow stick to everything, leading to the most gorgeous drive to and from church I've had in a long time. Used the last few bucks on my gift card to see Captain Marvel Sunday, and with the points from my movie card got free small popcorn and paid $1.07 to upgrade to medium. Made for a very fun and affordable afternoon! Happy Birthday to my amazing middle-aged brother! May God continue to guide your path and fill your life with blessings in the year ahead! It's been a treat to enjoy predawn light at the bus stop and a few lovely sunrises on the ride to work. Gotta savor it for the last few days before Daylight Savings kicks in. A surprise from a coworker on Friday: she made homemade Cambodian spring rolls for lunch for us, and she made some veggie ones just for me. What a kind treat! Blessed Saturday by a morning devotional quote that felt aimed right at me: Waiting on God doesn’t mean sitting around and hoping. Waiting means believing he will do what he’s promised and then acting with confidence. My editor is really enjoying my fourth Geren novel! A lull in the weather meant it was easy to get out to the movie theater Saturday to see How to Train Your Dragon: The Hidden World, and it was super affordable with my gift card! Tuesday morning, zero degrees and snow everywhere...heard three different cardinals singing. Now that's faith. 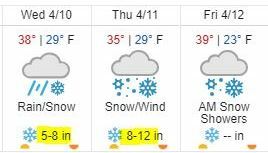 Never mind it's the snowiest February on record, around the 6th snowiest month of any month, they know spring is coming regardless! Delighted that my state and federal tax refunds have arrived already! I was in charge of the monthly publish to production on Tuesday, and due to having a new project to kick off, had to come in early and stay late. However, to my delight, I got through nine publishes with pretty good speed, so I only had to stay around half an hour late--much better than I was expecting. Better yet, nothing major has blown up since the publish. Quite glad for that. Wednesday brought some 8-9 inches of snow in my area and easily boosted February of 2019 to snowiest on record (since 1885 or so). Excitement! But due to it not being very windy, or cold, and plenty of people taking off, travel was a lot better than I expected. Took the earliest bus to I got to work a bit early, and was actually home earlier than usual. Sleeping on my futon instead of my bed is over, thanks to how quickly the maintenance crew addressed the pipe issue, took out the waterlogged ceiling light in my bedroom, let the area dry, and replaced it with a new one. Just one day later than they said, because of course they had to spend Wednesday shoveling all that snow. Very pleased! Saturday morning, discovered that the ceiling light fixture in my bedroom was completely full of water. Grateful to God that I didn't turn on the light and potentially create major issues, that the leaking has not happened much since then, and that I can sleep on my futon until this is over. Happiness is doing tax returns and finding I'm due for nice refund after spending last year not expecting much of any! Not as big as prior years, but what a delightful surprise! Not as much snow on the weekend as the forecast; nice to have no trouble getting to and from church. Despite that reprieve, my area is standing at 4th snowiest February on record, and liable to climb that chart this week! Got out to see Alita: Battle Angel Sunday, using the theater gift card I got from my work anniversary. Enjoyed some of the trailers and quite enjoyed the movie also. Sunday made the 26th anniversary of when I first 'met' t'DoL, and found my life's passion and calling. Not a big one like last year, but it was fun to take it easy and celebrate on the weekend, and having a cold provided an additional excuse! Right before getting on the bus, I heard a little bit of cardinal song. Such an amazing assurance of spring in the middle of a snowy February! After all the snow recently, and having to work short lunches or stay late at times to make up for late buses, a delight to get to work in good time Thursday and Friday. It took them so long I was beginning to think it wouldn't happen and I'd need to do some shoveling myself Saturday, but the city finally cleared the path I take to the bus stop! Over a month yet from the equinox, but a delight to have a little sunlight while heading home from work now, and some obvious predawn light in the mornings at the bus stop. Wednesday was the big day this week. All Company Meeting. For a few reasons, I watched the livestream with part of my department rather than walking over, so that made for a different experience. The big announcements were some significant changes to the dress code, and then the yearly PSP (bonus) announcement. 6.5%! Better than I was hoping for, and while half goes into the retirement account and the remainder gets majorly taxed, I'm happy to have it! My old coil-style ice cleats were too tight for my new boots and not good enough for how bad the ice was early last week, so I used a gift card from Christmas to get some really good cleats. They make a huge difference but I can't walk indoors with them lest I put holes in flooring! I'm glad they're easy to take on and off and work so much better on sheet ice. I was not happy that, after scheduling my blood donation for Sunday expecting a snow-free day, we got nearly 5 inches instead! But I was able to get over there with a minimum of trouble and get back home before the roads got really bad or busy, and my iron was high enough--success! That made up for not being able to give in January due to being sick. Got my fourth Geren book ready and off to my editor Saturday, and she starts on it today. Excitement! I'm grateful for the handicapped bathroom stall on my floor at work when it's time to layer and unlayer in cold, cold weather! Having space and a small bench makes it so much easier. Deliciousness is getting to feast on my mom's fantastic homemade spaghetti and meatballs this weekend, that she so kindly made and I brought home frozen from California. Yum yum YUM! Enjoyed a different sort of deliciousness as my exercise fodder this weekend. That was thanks to the BBC 1995 Pride and Prejudice being available on Amazon streaming. Saw it all over three fun sessions and put 48 miles on my exercise bike! I would rather have it be -20 again than the nerve-wracking challenge I had trying to get to the bus stop this morning. Snow-melt, freezing rain, sleet, some combination thereof made it a gauntlet of wet ice to try to get across. It is a minor miracle I managed the distance without falling. Glad temperatures are dropping--cold ice is better than wet ice! The 'polar vortex' cold snap has been fun. Walking home Tuesday it was -18 out, and I was very grateful for the wind at my back. In the morning Wednesday, it was -28, and I was the only person who got on the bus at a place other than the park and ride! For Wednesday evening it was -15 out heading home, and -26 or so heading in Thursday morning. My wonderful boss's boss called a jeans day Wednesday to help us stay warmer. I appreciate that! Amazon Prime was a great blessing, as I was able to order clear ski goggles, pay a couple extra bucks for one-day delivery, and have them in time for Wednesday morning. They made a big difference since I didn't have to deal with my eyes getting cold or eyelashes freezing closed. Especially grateful for heat in this weather, as some people were without power and my work building ran off generator all day Wednesday. And for my heating pad, since when it's this cold, helps a lot to hang it in a bag under my coat and use it for warmth as I walk to/from the bus stop. Finished the winter picture I've been working on since December, so I'm happy to be free to gear up for the next art project. A treat to have a quiet weekend at last! A blessing to have mostly clear skies Sunday night a week ago. 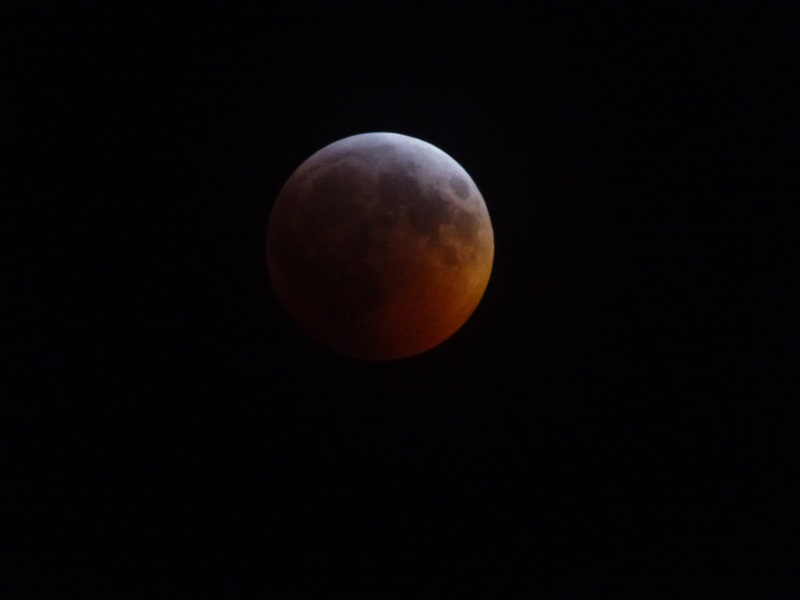 That meant I could get up right around when totality started, drive to a parking lot, and shoot a picture out the window of the lunar eclipse. Didn't hang around to watch, between it being zero out and having to work the next day, but glad I got to see it. I've been enjoying the benefits of Amazon Prime movie streaming and being able to hook up my projector like it's a second monitor. It's plain the forecast is a little chilly when my area gets a post on the Weather Underground blog! So far, it's been "only" -6 or -8 some mornings, so it will be interesting to see if this -20 or lower pans out! Speaking of cold, I'm glad the Towner's minivan has started for me the past two Sundays so I could drive to church. Also very grateful yet again for my heating pad to keep my hands from freezing stiff as the heat in the minivan doesn't really work. It was a real treat to give my last single page calendar to Carla who does my prayer counseling. More so, as she was just saying how much she needed a 2019 calendar right before I whipped it out. Fun for both of us! I am immensely enjoying the load of homemade pear bread my wonderful mother made me. Won't last much longer! To my delight, winter has finally stopped being completely pathetic around here. Finally had a little snow Friday, and it got cold enough I could 'squeak' my boots on it as I walked to the garage Saturday morning. Saturday morning was 0 and today it's -4! Saturday was fun and food-filled because Cindy and I got together, did shopping at Costco and Trader Joe's, had lunch at Cafe Zupas, and caught up. Got to show her my photos from my trip and see photos of her grandkids. Can't forget--Trader Joe's was double the fun with a Christmas gift card to spend! Delighted to find out that my boss is using and enjoying the Christmas gift I gave her. Happiness is delicious leftovers sent home with me from my mom. Got to have pink beans and fried plantains with dinner on Monday, a tiny taste of Puerto Rico! Been making superb progress with pass 6 of my fourth Geren book, so that meant I was able to move forward with setting up a contract with my wonderful editor. Excitement! At the beginning of the month, I broke a watch band I'd enjoyed for a few years. So...that was my cue to go back to the Etsy seller and buy four from her this time, and now I have five color options total. I'm so glad for places like Etsy so I can get bands small enough for my scrawny wrists!